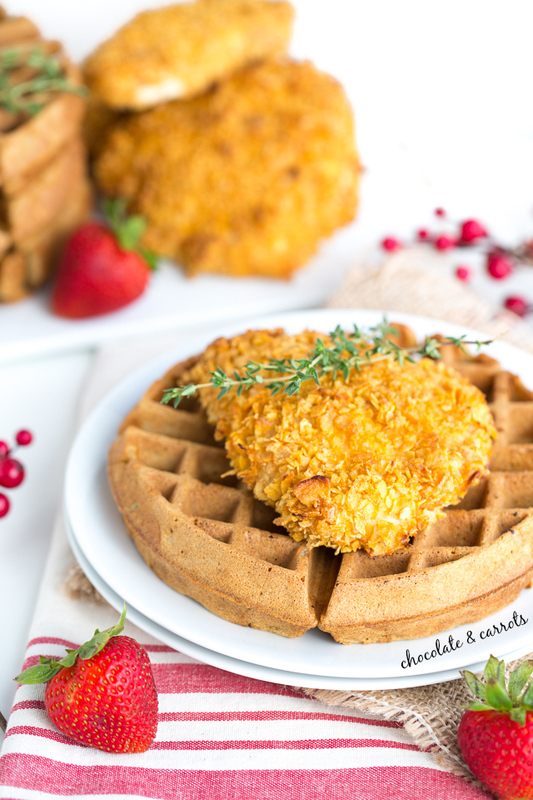 A healthier take on the Southern classic of chicken and waffles. It took a week, but we’ve officially moved from Columbia to Charleston, South Carolina. 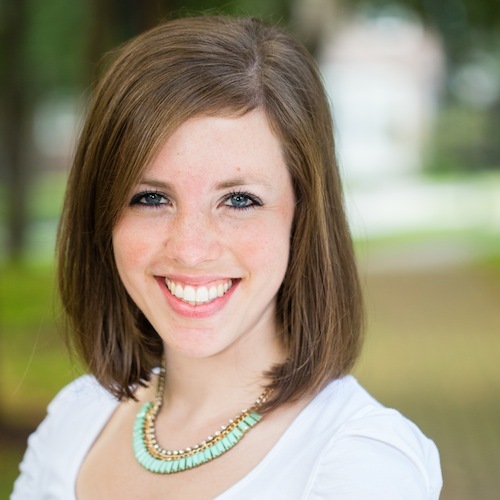 With my birthday, my husband and my 5th wedding anniversary, Mixed Conference and Thanksgiving all within the week of our move, I’d say it’s an understatement that I’m still functioning. Needless to say, we couldn’t have done it without the help of our family. We’re now living with my husband’s family while we search for a place to permanently live. We’re getting to know our family really well. Since I am and will always be in love with being in the kitchen, my job remains the same: feed the people around me. Being born and raised in Charleston, chicken and waffles are no new thing. When you see them on a menu just order them. They are amazing. 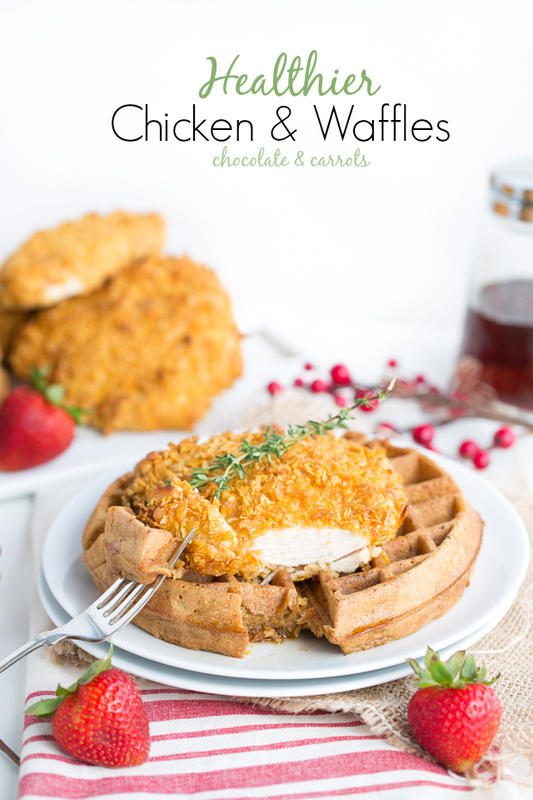 Typically, the chicken is battered and fried and the waffles are the good-old classic white-flour variety. 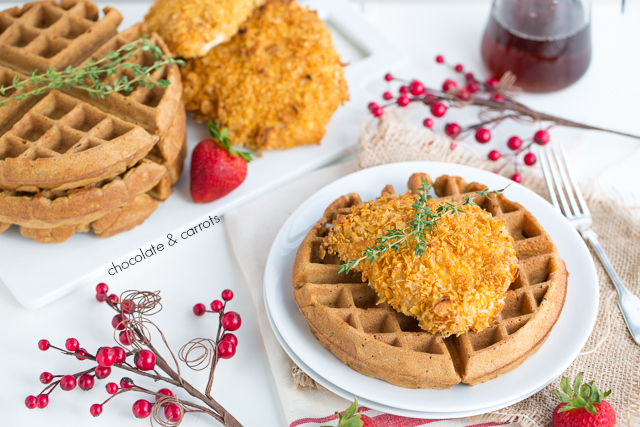 We’re making this chicken and waffles dish healthier! Now that our Target has a grocery section it’s so easy to go pick up Gold’n Plump® Boneless Skinless Chicken Breast to make a moist meal. Being a stickler for ‘happy chicken’ I really appreciate that I can pick up the Gold’n Plump® chicken that is natural and family farm raised chicken. Love. This specific package that I purchased comes in pre-trimmed and individually packed chicken breasts. But, feel free to use their fresh Boneless Skinless Chicken Breast Fillets for this meal, too. 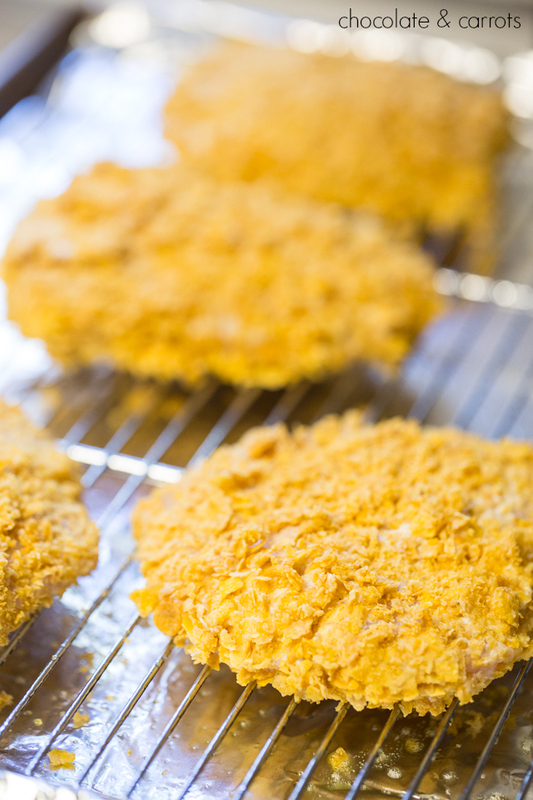 To make the moistest and healthiest breaded chicken without the use of a frying pan, we’re going to use a great method of breading and baking the chicken. First you dip the chicken in flour, followed by an egg white and yogurt mixture and finally dipped in crushed corn flake cereal. These layers will allow for a perfectly crunchy outer layer. Then, you’ll spray an oven safe cooling rack placed on a foil covered baking sheet with cooking spray. Lay the coated chickens spaced evenly on the cooling rack. Then spray the tops of the coated chicken breasts with the cooking spray. This will give them the golden brown color that you want. While that’s cooking, you can make your waffles and have a hot meal on the table for your friends and family in no time! Food is such a beautiful way to bring friends and family together. Being that it’s the holiday season makes it that much more special. 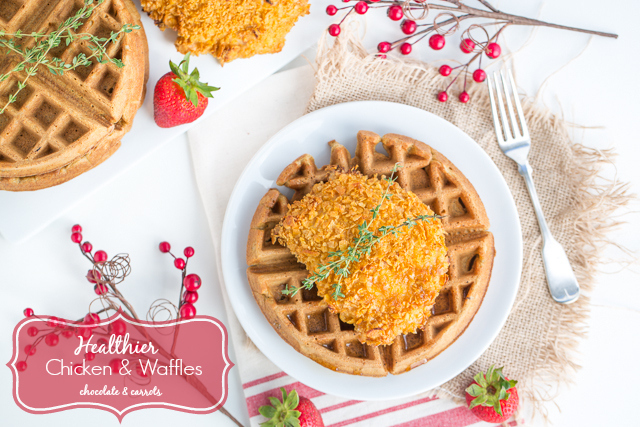 Do yourself a favor and make healthier chicken & waffles for you and your family. They will love you forever. 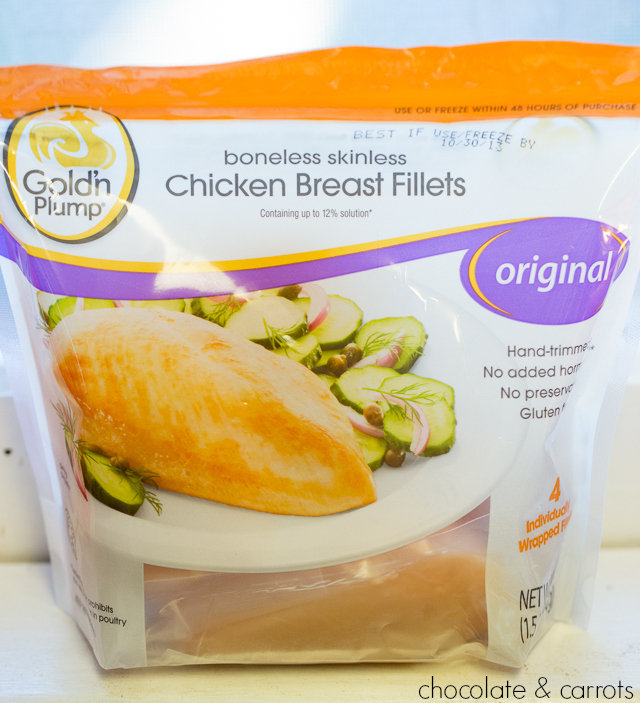 Also, when in doubt, check out Gold’n Plump®’s Pinterest page for some more chicken recipe ideas. They are a great resource! 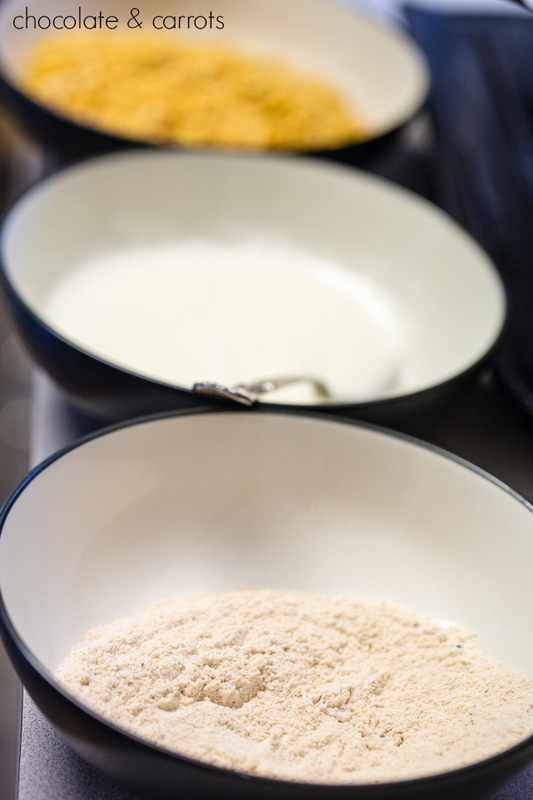 Prepare three bowls for dipping: one with flour, salt and pepper; one with the egg white and yogurt; and one with the corn flake pieces. Be sure to stir each bowl. Spray top tops of the chicken with cooking oil spray to achieve golden brown chicken. Bake for 20-30 minutes until thoroughly cooked and juices run clear. Preheat your waffle maker (I have this belgian waffle maker). 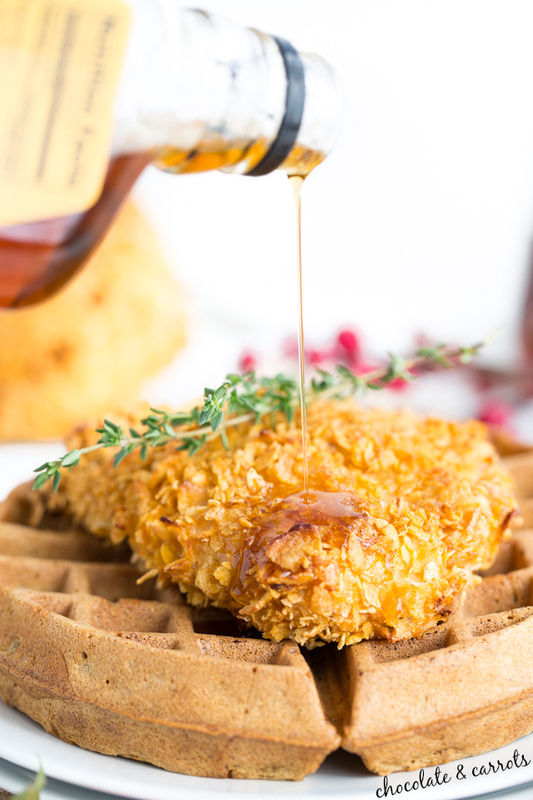 Once the waffles and chicken are done, enjoy together with maple syrup. This post was sponsored by Gold’n Plump. I received compensation for this post. All opinions are my own. Please read my disclosure policy for further information. 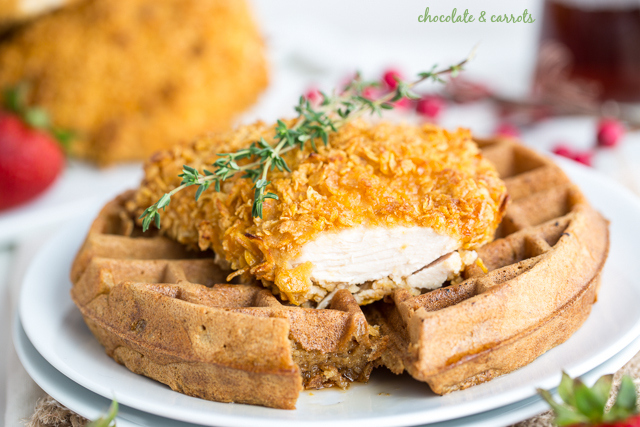 I actually never have tried the combination of chicken and waffles before.. but clearly I have been missing out on something delicious! Oh. My. Word. You must! It’s a Southern classic and the flavor is out of this world!